With another year upon us, B2B marketers are still struggling to reach the right buyers. No marketer wants to send 100 leads to her sales team to close a single deal; it would be incredibly more effective to send 10 qualified leads to close the same deal. The problem is, most leads in our marketing databases are cold. They’re not in the buying cycle— research from Vorsight suggests that only three percent of your market is actively buying at any given moment—and marketers must use data to prioritize the leads they send to sales in order to avoid wasting effort and losing potential revenue. The advent of marketing automation systems has helped marketers get ahead of the curve. Social media allows us to identify interested prospects earlier in the buying cycle, long before they come to your website or open your emails. Almost every buyer starts his research in social channels, looking at brand pages, interacting with peers, and discussing hot topics. This data provides a wealth of buying signals, but it’s pointless unless you integrate it into your marketing automation system. That’s when marketers and salespeople can really use social media to close sales. I witnessed the deal-making power of social media contact at Inbound 2016. My company had a physical booth in the exhibit hall, but we wanted to ensure we were able to have actual conversations with high-quality prospects. About a month before the conference began, we tagged marketers who had tweeted about Inbound or who followed Inbound’s Twitter handle. We plugged these cold contacts into our marketing automation system. We then sent emails to these contacts, mentioning we had seen their tweets about Inbound. In those emails, we told them where they could find us and said we’d love to meet them. Suddenly, we found ourselves swimming in potential customers. Our targeted emails lured high-level prospects to our booth for demonstrations and eventually sparked conversations with our sales team. All we had to do was reach out and make meaningful contact. Every B2B company—startups as well as large enterprises—should now be using social media in the sales cycle. But they aren’t all tracking social lead information effectively. MegaCorp aimed to convert more leads through targeted email campaigns executed in its marketing automation platform. The company faced a dwindling response to marketing emails, but it had built a significant social media following. MegaCorp used technology to monitor the social media actions of its existing leads—based on Twitter profiles that showed an interest in the company’s brand or products—and then put that information into its marketing automation system as a time-stamped activity in lead records. This enabled the marketing team to create a new list of socially engaged leads and give context to interactions with social leads. This combination of reaching out to the right people with the right message can help turn a social media presence into profit. So what made the difference for MegaCorp? It wasn’t a sudden social media focus or renewed interest in selling products. The key ingredient in this recipe was a database that matched marketing efforts and engaged targets. Through an established social media presence, the tech company had already generated millions of potential leads interested in having a conversation. The problem was that company officials didn’t recognize the potential of their database. Once the company started tracking relevant social actions, company officials realized up to 58 percent of their leads had a potentially wrong attribution. In other words, these leads had engaged with the brand on social media before visiting the website and filling out a form. In addition, each socially engaged lead had participated in an average of 3.6 relevant activities on social media. Each of these leads gave the company’s sales team nearly four new opportunities to strike up a conversation. The company found socially engaged leads averaged an 11 percent higher lead score compared with traditional leads. In essence, leads who had interacted with MegaCorp on Twitter were 11 percent more likely to buy the company’s products. If the company’s social media team were to reach and nurture those socially engaged leads, MegaCorp stood to generate $20 million in annual revenue for one of the global company’s marquee products in North America alone. The first step toward gaining interest and trust from potential leads is to get their attention. Grow or maintain a robust presence on the social media networks your audience frequents. For a B2B marketer, that means posting and interacting with your audience on LinkedIn and Twitter. Post often, and make sure your material is interesting. Relevant, entertaining, or useful insights invite your audience to engage with you. Don’t make the mistake of simply pushing out content and letting it fade into the ether. Interacting with your audience is key. Comment on posts and respond to questions in a timely manner. Focus on building targeted emotional bonds with your audience. Know your audience as well as possible, and identify leads who have shown interest in your space. To ensure this data is actionable, capture behavioral social data in your marketing automation system. You’ve generated a lot of social engagements, but it’s important to identify the content that best converts visitors into leads, as well as how those shares and clicks translate into pipeline activity. Some of the most popular social media management platforms let you update your marketing automation system with precise lead information, including the social network and profile information of the person who clicked on a given link, a time stamp of any actions, and whether the lead converted on your website. You can also use technology to monitor the social activities of leads already in your database. The goal here is to identify leads who are showing interest in your space and use their social actions as the context for your sales team to reach out. Once you’re tracking buying signals of your leads from the social web, you can identify warm leads and develop your relationships with targets through strategic messages. You can set up campaigns for individuals who came to you through a given social network or narrow your efforts down to people who engaged with a specific hashtag. In our own sales process, we find leads who have engaged with us on social multiple times and pass their information along to our sales development team. We recently were able to close a deal with a lead who had engaged with us only on social media. These social interactions provide an incredible opportunity to draw your leads further into your business and closer to the point of sale. The stats bear this out. About 67 percent of B2B marketers reported a 10 percent boost or more in sales opportunities after using social media to lock onto specific targets. A portion of that same cohort reported an increase of 30 percent or more. This is not a “set it and forget it” process. You’ll have to do some ongoing analysis to figure out how your existing leads are engaging with your brand and products on social. While it’s great to engage with leads through emails and social media content, you’ll want to take the next step and funnel warm leads toward your sales team. In this process, speed matters. 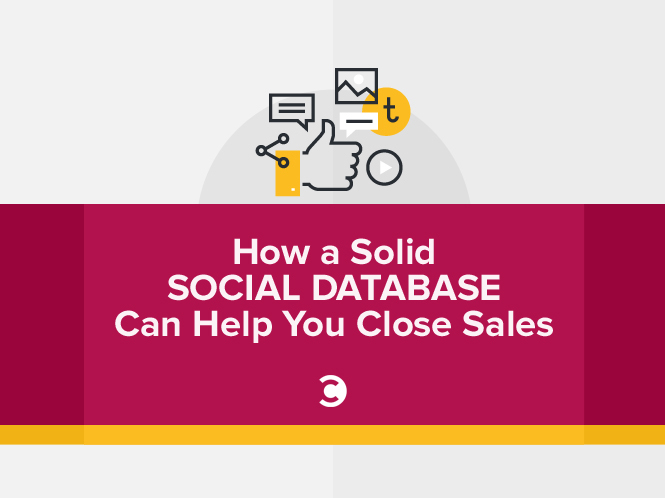 Research from InsideSales.com concluded that a salesperson who follows up in less than five minutes is nine times likelier to close the sale. You can set up a rule in your marketing automation system to assign a lead to a sales rep as soon as that lead performs a qualifying action. For example, a lead who just mentioned a competitor of yours in a tweet could be a prime candidate for a sales conversation. The sales reps who call your leads should also be able to see the content that engaged them. This information can shift that interaction from a cold call to a follow-up with an interested buyer. There’s already rapport between the leads and your company, so let your sales team leverage your hard work. By pairing social media engagement with a marketing automation system filled with rich insights on your prospects, you can increase the effectiveness of your email campaigns, focus on the right leads, and pass more qualified leads to your sales team. Without ever meeting your sales prospects, you’ll know exactly how they stumbled across your company as well as their unique interests. Potential B2B buyers who report feeling a “high brand connection” to a company are 60 percent likelier to consider and make a purchase from that company than from competitors. Social media provides a great way to forge and nurture those connections. The trust you foster between your company and prospects can be the difference between closing a sale and losing a promising lead to a competitor. Aseem Badshah is the founder and CEO of Socedo, a demand generation system that helps marketers discover, engage, and qualify leads through social media to increase revenue at scale. Aseem has been a leader in the social media marketing space for more than eight years. Before Socedo, Aseem founded Uptown Treehouse, a marketing agency for Fortune 500 brands focused on social media.